FROM training elephants to topping pizzas, Floria chef Nigel Crumplin certainly has an interesting CV. 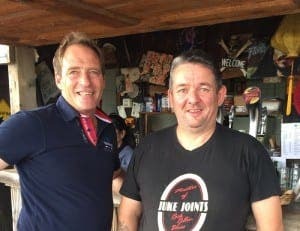 Arriving in Manilva five years ago, Brit Nigel swapped the circus for the kitchen when he teamed up with local Dutch restaurateur Peter Nette at Floria. And while Nigel, 48, admits there are ‘little-to-no transferable skills’ between training circus animals and serving up tapas, his move from Circus Flora to Floria chiringuito ‘seems like fate’. Nigel spent four years touring the USA with the circus in the 1990s. 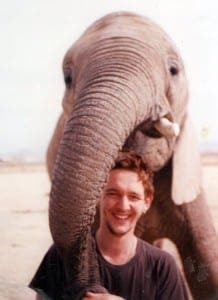 His main duty – and the one he enjoyed the most – was training with the star act, Flora the elephant. As well as training Flora, Nigel also worked with four horses, a goat and a piano-playing cockerel. Nowadays, sporting an apron and chef’s hat, Nigel has trouble convincing Floria’s punters of his glamorous past. “People see me in the kitchen now and assume that is what I’ve done my whole life,” he adds. 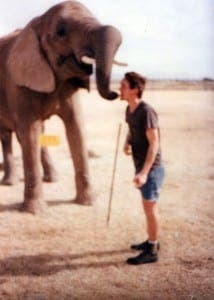 “I now don’t leave the house without taking the photo of me kissing Flora on her trunk. With a large decked area as well as musical performances, Floria can cater for kids’ parties and special occasions.